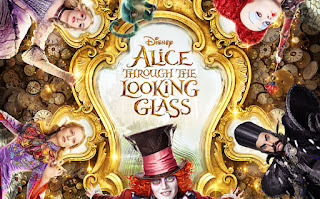 Alice Through the Looking Glass is the sequel to Alice In Wonderland the first book written by Lewis Carroll and the first film produced/directed by Tim Burton. The story once again follows Alice Kingsleigh and her journey to Underland, however this time she is lead by Absolem to the Looking Glass where on the other side she meets the White Queen, the Chesire Cat, the White Rabbit and Tweedledee and Tweedledum. Her Underland friends tell her that the Mad Hatter is gravely ill over the long ago loss of his family; and hoping to help the Hatter by visiting the past and saving his family on O Frabjous Day, Alice is told she needs to visit Time so she can use the Chronosphere to travel into the past. A task none of the other Underland residents can complete in fear that they will see their past selves and destroy history. When Time refuses to give the Chronosphere to Alice, she steals it and whilst being chased by Time through the past, she goes on a journey where she discovers different parts of the puzzle she needs to resolve in order to save the Hatter. She also encounters younger versions of the characters including the evil Red Queen and the younger Hatter. Back when Alice In Wonderland was released in 2010 I was a huge fan of the film, and the same goes for this one, I thoroughly enjoyed watching the story of Alice and her friends continue, as she goes on another adventure, so different from the original story of Wonderland. I loved how as Alice went on her journey she discovered the task given to her wasn't quite as simple to solve as she originally thought, and a lot of the audience can relate to this, as things are never really as simple as they first seem but the journey you go on makes you learn new things and you come out better and stronger on the other side, and all these journey's make up your life. The only bad part of the film I could really think of was, that it was a quite fast pace film, and although this is generally a good thing, parts of the movie did feel a bit rushed, so I think they could've expanded some areas - like the clips of Alice interacting with the characters in the past - and made them slightly longer so more development was included in the scenes, such as the 'sisterly' relationship between Iracebeth and Mirana (the Red Queen and the White Queen). 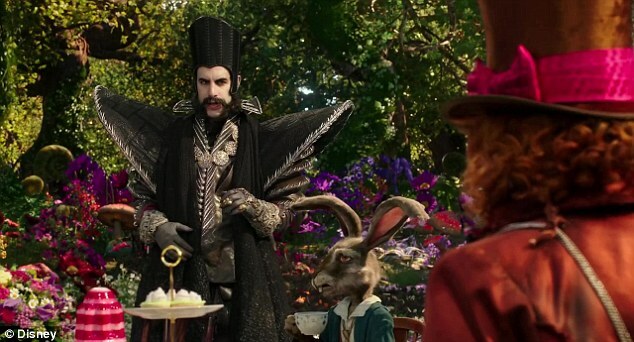 The Time master was definitely one of my favourite characters in the film, although I absolutely adore the Mad Hatter and Alice, the new addition to the Underland team was a really good one. Although he is portrayed as the bad guy in the movie trailer, Time actually just wants the best for Underland, and after Alice steals the Chronosphere, she puts the whole of Underland at risk by stealing the thing that keeps Time functioning. The longer the chronosphere is missing, the more panicked Time headquarters becomes, as the main clock begins to break down and everyone worries it is the end of Time in Underland. 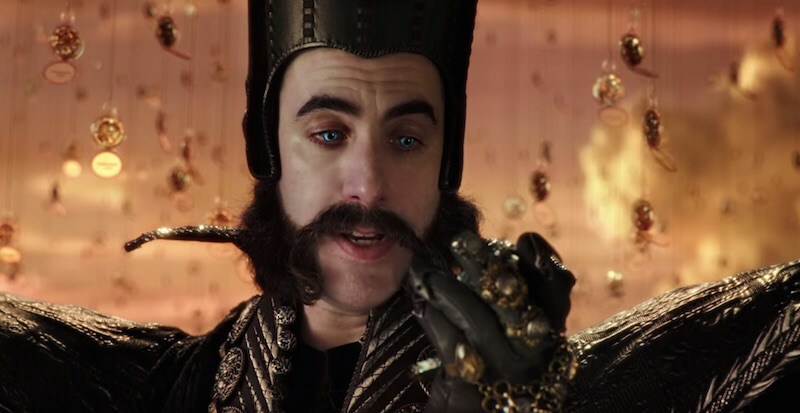 Time is quite an entertaining character, with his unique personality (that is quite hard to describe or explain), teamed with his voice/accent, that is so different from the rest of the characters - he kept me very amused throughout the film. Even when he was panicking about the Chronosphere, the way he voiced how he was feeling and reacted to the situation was very entertaining. He also did some seemingly unusual things but I think they all contributed to making the character so comedic and unique. Overall, I would hugely recommend going to see this film, if you loved the first movie, you'll bound to love this one - plus seeing Gloucester docks at the beginning of the movie, is something you need to see if you're from the local area. 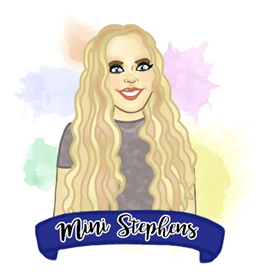 "You can't change the past, you can only learn from it"